The magnetic resonance imaging scanner. Paramed Medical Systems has introduced a novel new MRI scanner, based on a revolutionary magnet technology and a novel open architecture. This technology made it possible to adapt a new U-shaped configuration, designed to avoid claustrophobic reactions of patients by creating open space above the patient’s head and body. The system’s versatility is enhanced by the fact that its transverse field means that users can employ both flat coils for spine imaging and solenoidal coils for brain studies, while its open configuration also makes it possible to scan patients in weight-bearing positions (standing or sitting). 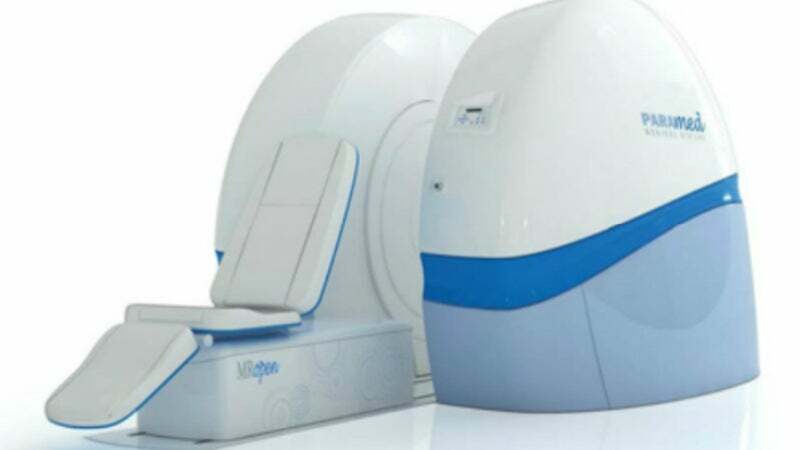 The machine was given a dynamic and at the same time friendly design to further emphasize the technological performance and innovational character of the scanner and to make the patient feel at ease while undertaking an exam. The combination of white and light blue colours create a relaxing atmosphere in order for the patient to feel at ease during the exam, which requires the patient to move as little as possible to obtain the best results. The final result was a great looking machine, developed from sketch to a functional prototype in only five weeks, which enabled our customer to present its product at the world’s most important trade fair in this sector. We are pleased and proud to announce that Creanova received an "honourable mention" in the 2009 reddot design award competition for the design of this innovative MRI scanner – more than 3,200 submissions from 49 countries were received.